Leg Bags W/ Comfort Strap and Slide-Tap Drainage Port. These sturdy bags are latex-free and have a sterile fluid pathway. 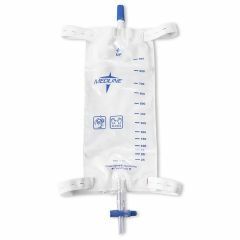 Leg bags are 19oz or 600ml. I would use these everytime. I really like the slide tap leg bags. They are very easy to use and not complicated. replaced the fas tap bag. the fas tap worked better. slide port opening harder. Retired. Quad with some right hand. This is the best leg bag ever! Manipulation of the slide valve is so easy and I don't feel like I need a third hand. With the other type (screw on/off), it is difficult to hold a urinal, unscrew the cap, and aim with just two hands! I am PCA and my client has used these for years and overall very happy with them but the latest order we put in leaks. Not sure if just a bad batch or switched manufacture but it is a lot of work for him to have to change his clothes and we are going to have to try a different bag. I need several sets of the leg straps that have a garter type connection to a button on the sides of the bags. I cannot find an option to purchase them separately. Do you sell them separately from the bags? Does the valve fold up into a sleeve? I want to order the 561625 and have a question about the straps. Are they velcro?